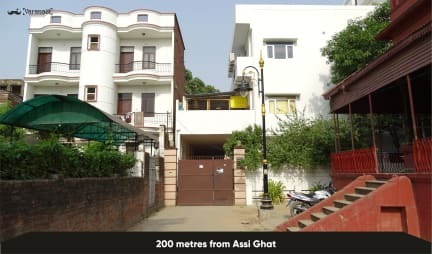 Moustache Hostel Varanasi i Varanasi, Indien: Reservér nu! 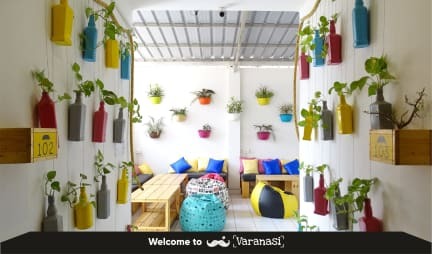 Moustache Hostel Varanasi is located in Varanasi’s city centre, which is roughly 6 kms from the train station and an hour’s drive from the airport. What we have to offer you is more than just a place to rest. The hostel is composed of a spacious lobby and a very well-ventilated common area. It hosts mixed and female-only dorms with shared bathrooms. Moreover, get to enjoy perks such as free WiFi, reading lights, charging ports that come standard in the rooms. Relax, work or play in our cosy common room with a cup of coffee served right out of our coffee machine and enjoy the breathtaking views of the Ghats and River Ganges on our gorgeously put together rooftop terrace. You can also go for a stroll in the lush green park just across the street from the hostel. Other facilities offered at the property include hot water, board games, daily activities, library and luggage storage along with free parking space. 1. Please note that the property does not encourage group bookings and long stays. 2. The property will send a confirmation email with detailed directions and check in procedure. 3. Please note that 1 day advance notice for free cancellation Please note that no children below the age of 18 are allowed. 4.Please note the property can be reached best by email. 5. Please note that residents of Varanasi are not permitted to stay at the hostel. 6. Please note a valid passport and visa for foreign nationals and a valid photo ID and address proof for Indian nationals during check-in is required.